Our favorite facial sunscreens. It's never too late to start being safe! We all hear it...every day...wear your sunscreen! As girls who grew up literally in the sun in sunny California, spending endless days at the beach or by a friends pool, we know as much as anyone just how important sunscreen is. The suns rays are responsible for premature aging, skin damage, and the worst of all, skin cancer and melanoma which is one of the deadliest forms of cancer. SPF is really personal to us...not just for the vanity reasons because hey, we are getting older after all and would love to slow down the aging process as naturally looking as possible, but because we have both had to deal with our own scares. Mieke and I have both heard the scary words "We have to test that". A while ago, Mieke noticed an odd patch on my ear that looked much like a hot iron burn. It turned out to be cancerous cells on the tip of my ear that had to be sliced away leaving my ear with a cute but not fun divot. I now get my ear checked every 4 months and apply a Chemo cream to attack and kill the cancer cells. Mieke had a spot on her nose that was pre-cancerous that she had to treat with Chemo cream that in essence burnt away her pre cancerous skin cells. Had we used more sunscreen regularly we probably could have avoided that all together. We were both lucky to catch and treat ours early. So with that we are hear to tell you... WEAR YOUR SUNSCREEN! Tarte Tartegaurd SPF 30- I LOVE THIS! It is totally mineral based, cruelty free and chemical free with almost zero white cast! Most days people actually say I am glowing...and it's not me...it's my sunscreen. 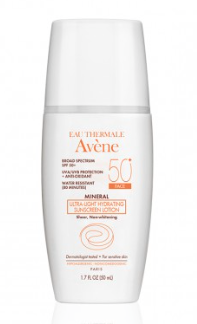 Its great under makeup (light dusting of powder is required so it doesn't look too "glowy"
Avene Mineral Ultra Light SPF 50- LOVE this one! While rummaging through my cabinet I found an old bottle and remembered how incredible this is under makeup. 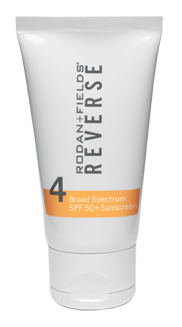 It is mineral based and 50 SPF so there is a slight white cast but a little blush and you are good to go. It is not greasy and totally lightweight. A perfect summer sunscreen. IT Cosmetics Anti Aging Armour SPF 50- As lovers of IT Cosmetics we can NOT wait to try this one! 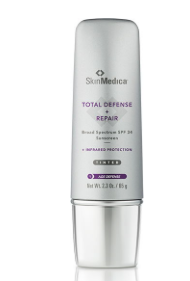 So far we have loved all of their products and this one seems almost too good to be true. But after doing the research it is not! Mineral based, sheer, lightweight, skin perfecting and cruelty free...just ordered it and it's on its way to our cupboards. Actual image of a truck driver and the sun damage done to his side of the face from the drivers side window. Tell us in the comments what your favorite one is!